The paper stock for the entire university stationery system—letterhead, envelopes, etc.—is Strathmore Script, bright white, sub. 24, smooth. For business cards and self-adhesive labels, appropriate stock to match the Strathmore bright white should be selected. No other shade, color, or style of paper should be used for any university stationery. 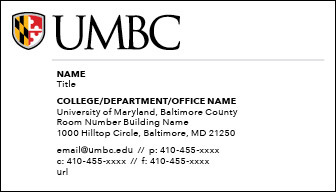 The UMBC letterhead has been designed to allow a flexible setting of body type. 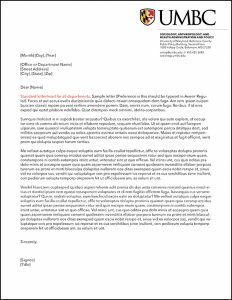 There are a few simple guidelines that should be followed to complement the design of the letterhead. For best results, the letter text should be set flush-left, ragged-right, in 10 or 11-point Avenir Next or Times New Roman. Left and right margins should be set at 0.75”. The dateline should align horizontally with the last line of the department information on the right, or 1.9375” from the top. The bottom margin can vary according to the length of the letter, leaving at least a 0.5” margin. The date, address block, and signature block should all be set flush-left and not centered. Questions about purchasing stationery items should be directed to the Creative Services department at 410-455-2957.
optional phone numbers (cell and/or fax). TTY is no longer required. Please note: These are currently one-sided cards (although an option to include social media information is being considered for the card backs). URLs should be official UMBC web addresses. The cards are not set up to print in multiple languages. In addition to the letterhead and business cards, various sized envelopes are also included in the standard stationery system. Please check with Strategic Factory for the available options.